I requested a friend, a very famous Radio Jockey, to have Radhanath Swami as a featured guest on his show. He felt it was an honor. We fixed the date 3 August 2009 for the interview. When August came closer I realized that the interview date lay amidst a cramped schedule: on 1st August Radhanath Swami was to arrive in Mumbai where thousands awaited his audience; on the 2nd was the Sunday Program at Radhagopinath temple where he was scheduled to discourse; and then on, he would be busy with the upcoming grand India Book Launch of The Journey Home that was to be held only days later. Thus 3rd August, the day fixed for the radio show—had got crushed in the middle. I grew tense. Pulling Radhanath Swami out of his busy schedule for the Radio Show was to cause him strain—and I hated to do that. Perhaps he sensed my tension. And his soft heart raced for every opportunity to relieve me of that. On 2nd, I visited him with a proposal: was it okay if the RJ came to his room to interview him, rather than he having to go to the studio? After thinking for a while, he responded, “It will be better if you could liberate me from this place.” Through that one line he liberated me from my thought that going to the studio caused him inconvenience. It was decided that we would stick to our schedule and drive to the studio the next day. The next day as we rode, the car was heated up with discussions about the upcoming book launch. I was silent, while remorse lingered in my heart. He is already strained. Perhaps I should have rescheduled the show in a way that didn’t cause him extra strain. Out of the blue, Radhanath Swami quipped, “And towards the end of the book launch, Sankirtan shall perform solo dance with spotlights focused on him.” His body rocked in laughter, as everyone in the car joined him in the joke; all knew how shy I was. Seeing him laugh, I was elated. Thus in a moment, Radhanath Swami had the remorse in me ebb away. nice article .. keep posting..
Hare Krishna… Radhanath Swami Ji Jai ! Wonderful interaction. Radhanath swami maharaja is exemplary in his dealings with others. He teaches us how to please the other person to the full. Very inspiring and full of determination. Radhanath Swami has that unique ability to relieve people of their greatest anxieties. Thank you for this wonderful story of Radhanath swami explaining about his dedication. Thank you for sharing this nice experience with HH Radhanath Swami. Thank you for sharing this nice experience with HH Radhanath Swami which can even relieve us. Thanks for sharing. Maharaj leads an extraordinary life. 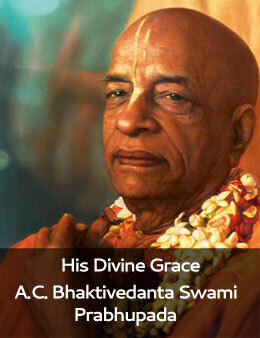 He can accomplish what others cannot simply because of his being a pure devotee of the Supreme Lord. His presence anywhere is divine. It was too good for all those who ow SankirtanP. sweet article… please keep posting these article about maharaj. Thank you for sharing this poignant incident from Radhanath Swami’s life. HH Radhanath Swami exhibits this nature of true love which makes one understand the heart of the beloved. Radhanath Swami being a devotee of Lord Krishna is very sensitive to feelings of others (be it his disciples or his god brothers/ sisters or other devotees). He can easily sense if a person is unhappy or tensed and can relive them easily. He is a very loving spiritual personality to be around with. Thx for sharing, Maharaj Ki Jay. Hare Krishna…Radhanath Swami Ki Jai ! One more experience speaking of the sensitive and loving nature of Radhanath swami maharaj. Too good !! Thanks for sharing this.